Several new photos have surfaced for two films — the highly anticipated Jobs, featuring Ashton Kutcher, and Park Chan-wook’s Stoker, featuring Nicole Kidman and Mia Wasikowska – both of which just gained acceptance into Park City for 2013′s Sundance Film Festival. From Oldboy helmer Park Chan-wook comes the story of betrayal, mystery and suspense. When India (Wasikowska) loses her father in a tragic incident, her uncle Charlie (Matthew Goode), whom she’s never met, comes to town and stays with her and her mother Eveyln (Kidman). Soon after his arrival the town experiences an unusual spike in homicides. The recent events push India’s curiosity as she yearns to learn more about her estranged uncle, but will her inquisitive nature get the best of her? The anticipation for Chan-wook’s first US film is high. The South Korea native is best known for his work on Oldboy, the film which Spike Lee will “reboot” and bring to US theaters. While Chan-wook fans announced their disproval of Lee’s Americanization of such a stellar film, he’ll move on nonetheless. The trailer, which premiered several months ago, showcased a usually charismatic Wasikowska (Alice in Wonderland) looking quite eerie. The beautiful and talented Nicole Kidman, who every year seems to deny the natural process known as aging, showed her portrayal of a creepy mother. Stoker premieres at Sundance next month, but those of us not attending the festivities can catch the film in theaters March 1st, 2013. The Joshua Michael Stern directed film simply titled Jobs, will not only make its premiere at Sundance in January, but it will also close the festival on January 27th. 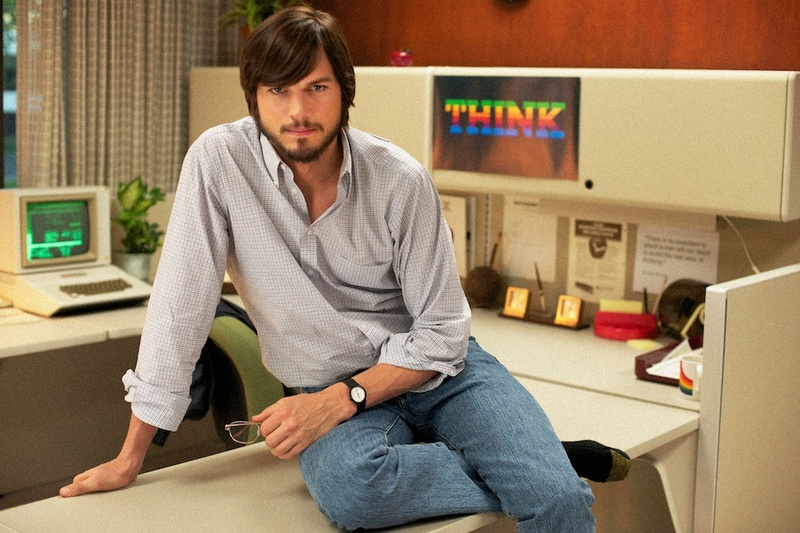 This isn’t our first look at the comedy actor in his Steve Jobs garb, but it is the first official look. We’ve already seen photos of Ashton Kutcher off-set grabbing a cup of coffee from the nearest Starbucks wearing the Apple-founders’ classic garb: a black turtle neck, light wash jeans, and New Balance sneakers. Still, the question remains: sure Kutcher looks the part, but can he really nail down the portrayal of such a beloved man in history? The new photo does a great job in helping us believe so with Kutcher casually sitting on a desk, shoeless, the Jobs beard and stache present. We’ll have to wait and see when Jobs hits theaters next year (an official wide release date has yet to be announced).